I heard the most amazing phrase this week. So amazing that I wrote it on a card and put in in the little magnet-thing on my desk. 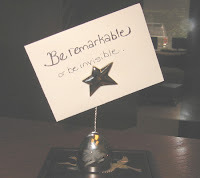 Be remarkable or be invisible. It comes from Seth Godin's book, Purple Cow. The idea is that brown cows are okay, but they are so common as to be mundane. A purple cow--however--is something remarkable. I once had the VP of Marketing of an international firm approach me at a meeting and say, "You have marketed yourself very well." My response was the professional equivalent of, "Huh?" He said, "I heard of you before I met you. You are the one with the crayons." Personal branding. A primary rule of marketing is that your brand has to be rooted in who you really are. In the case of personal branding, it would seem to be even more true. So the question is....if we live in a world of special and unique people, why do we see so many brown cows? Okay, not literally, but stand on a street corner downtown during lunch and you'll find little to distinguish individuals in the pedestrian traffic. I think it has to do with risk. 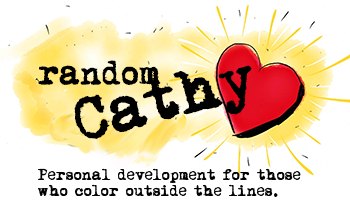 There is risk in taking crayons to a meeting of professionals you've never met before. Risk in flip flops, bow ties and pink trenchcoats. Risk in allowing others to glimpse the part of you that is different. Being part of the herd? Now that's safe. And, not the least bit remarkable.